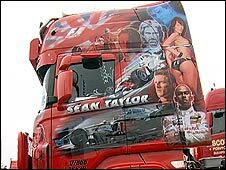 It's billed as the biggest get-together in the lorry-driving calendar, but this year's Truckfest in Peterborough, in the English Midlands, was a show with a serious side. As the main arena reverberated to the sound of monster trucks and motorbikes, away from the action, hundreds of lorry drivers seized a rare chance to meet up and talk. There are more than 400,000 lorries on Britain's roads. The haulage industry touches every corner of the country, and it's an industry under a cloud. As truckers gathered around sizzling barbecues, the conversation was all about unemployment and pay cuts. Almost every driver has a story to tell. For increasing numbers, it's about how they lost their jobs and how they have managed since. According to the Office for National Statistics, 15,255 HGV drivers claimed jobseekers allowance in March 2009, up from just 3,280 the previous year. It means there are now almost five times as many drivers out of work, and the statistics show they are losing their jobs more quickly than almost every other sector. Mark Hull is one of them. "I lost my job at the end of last year," he said, "and my boss lost everything. "I was lucky enough to find another job. Others haven't." 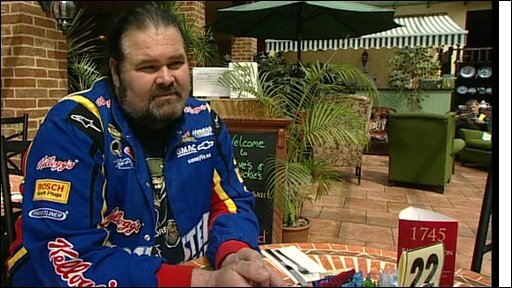 A few metres away, another driver finished his burger and shared his story. Andrew Sherman is a fully qualified lorry driver, but has just started a new job in Yaxley as a mechanic. "I got laid off from one job," he said, "then I found another driving with containers and got laid off from that as well." The rest of the group still have their jobs. They put on brave faces around the barbecue, but every one of them was fearful for the future. "I'm worried," said Dave Blake from Northampton. "I have a wife, kids, a mortgage. I'm living day to day." As the recession deepens, those who move goods around are caught in the middle. The industry magazine, Truck & Driver, has been watching it happen. At its trade stand, staff were discussing little else. "The road transport industry moves goods the length and breadth of Britain," said its publisher, Andy Salter. "If a manufacturer or a retailer goes down, there's going to be a haulier impacted. "You're looking at tens of thousands of jobs being shed. It will take a long time to recover." Out on the roads, the result is a dramatic reduction in the number of heavy goods vehicles. Official Department for Transport figures show they were down 7% in the final quarter of 2008 compared with the previous year. Newly-released figures for the first three months of this year show an even heavier fall, 12% lower than in the same period of 2008. To stay profitable, hauliers are having to make cuts wherever they can. 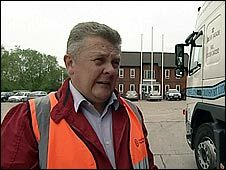 At their Suffolk headquarters, Leggett's Transport Ltd have even turned part of the depot into a lorry park to bring in extra money. But keeping the business profitable comes at a price. "Business fell off a cliff edge and we had to react," says sales manager Roy Leggett. "We had to reduce our fleet, we had to ask for voluntary redundancies and on top of that the staff we've retained have all taken a 10% pay cut. We're trying everything." As hauliers struggle to make ends meet, the government is raising fuel duty. In his budget, Alistair Darling announced a rise of 2p per litre from September, then by 1p a litre above inflation each April for the next four years. The Road Haulage Association says this has come at a time when the haulage industry is facing its biggest challenge yet, and that its survival is vital to bringing the country out of recession.